Drugs-depot.com features “best-quality” medications for the lowest prices possible. The shop stated that it is based in Trenton, New Jersey, in the United States, but its products mostly come from India. Drugs-depot.com declared that it is not an actual pharmacy, but is an escrow service which caters to the needs of clients by referring them to fully licensed ground pharmacies with excellent prices. The goal of the store is to bring satisfaction to its clients by providing the “highest level of service possible”. Most of the products on Drugs Depot are generic medications, and the shop assures its clients that the meds on the store are with excellent quality. There are only a few drugs available on the store; unlike the categories found on usual online drugstores, Drugs-depot.com only has six categories: anti-anxiety meds, general health meds, pain relief meds, sleeping aids, weight loss meds, and “Viagra”. Overall, the store only had a few drug choices—the shop merely had 17 items all in all, which is dissimilar from the usual extensive product offerings of other online pharmacies. Drugs Depot implements a no-Rx policy—its buyers can have any product on the store without being required any prescriptions for the Rx products. However, the store encourages the clients to consult with their physicians first before ordering any Rx item from the store. The limit for the orders on Drugs-depot.com is a three-month supply, so buyers can only order products within the limit. Although the meds on Drugs Depot are only few, the store still had options for erectile dysfunction treatment medications. The shop offers Kamagra Oral Jelly, Cialis, Levitra, Viagra, Viagra Soft, and Viagra Professional. 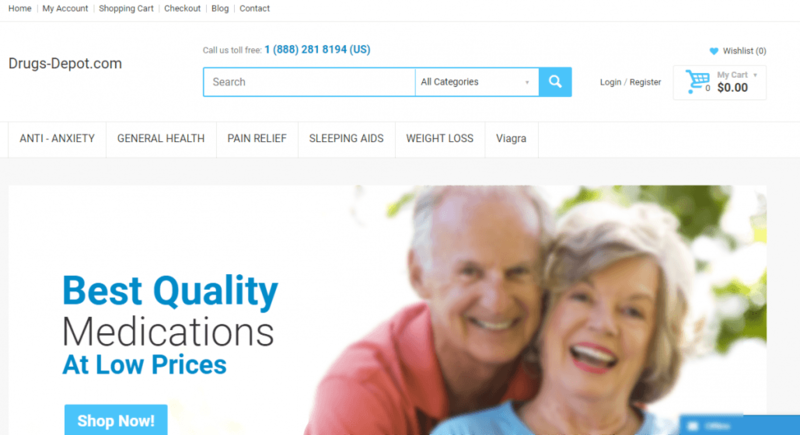 Drugs Depot offers generic Viagra 100 mg for as low as $50 for 30 pills, generic Cialis 20 mg for $60 for 30 pills, and generic Levitra 20 mg for $80 for 30 pills. Due to the shop’s no-Rx requirement, any patient can order these pills without the need for sending their prescriptions to Drugs Depot. If you are interested in ordering meds on Drugs-depot.com, you can pay for the items using credit cards alone, although the shop does not indicate what credit cards it does accept for payments. Shipping costs a flat rate $25, but the store only offers shipping to the United States, the United Kingdom, and Europe. Drugs-depot.com offers a satisfaction guarantee, but the shop did not state if it is capable of refunds and reshipments in the cases of concerns with the store. Drugs Depot only instructed the clients to contact the store in case they are “unhappy” with their orders. For urgent concerns about the store, the clients can always contact the shop using its live chat support option and the shop’s operators answer/resolve inquiries in real-time. 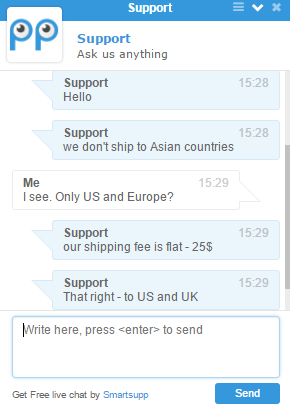 Apart from this live chat support option, the buyers can use the US number of the shop and its email function available on the store. There were no third-party reviews available for the store, but the shop had on-site comments available on its platform. Jill G, one buyer on the store (posted on June 2016), gave it a rating of 4 out of 5 stars and thanked the store for its “helpful support”. According to her, she was able to get the meds from the shop, and they worked pretty well for her. R. Boots, another client (posted February 2016), gave Drugs Depot a rating of 5 out of 5 stars due to the store’s impeccable customer service. Boots mentioned that he had been a client of the store for some time, which indicates good service on the store’s end. However, these store’s comments are only found on-site, which lessens their credibility. On-site comments for an online store are unreliable, as they may be used by the store to manipulate clients into believing its alleged “good service”. More on-site latest reviews are available for Drugs Depot, and most of them were positive comments for the store’s service. According to Phoebe (posted September 2016), the shop offered excellent products and service and thanked the store for her good experience. Mike (posted June 2016), appreciated the store’s capability to ship products without prescriptions and rated the store 5 out of 5. However, I saw one comment which was rather out of place—Simon’s comment (from June 2016) is not for the store’s service. The user merely asked if the shop was real and if the meds can actually reach him in California. This comment signposts that users without verified purchases can also post reviews for Drugs Depot. Since no external reviews exist for Drugs-depot.com, I checked the store’s record on Scam Adviser. I was greeted by a low trust score for the website (0/100) and the store was given a rogue rating and was linked to a number of suspicious websites. Overall, the store was labeled an unsafe store to shop from. Since I think coupon codes are important to clients, I checked if the online pharmacy had several coupon codes available for its clients. I was disappointed to discover that the shop did not have any discount offer prepared for its buyers, save for the small discounts for the increased purchases of the meds on the store. Drugs Depot is an online escrow service which caters only to a few countries such as the United States, the United Kingdom, and Europe. The store only had a minimal product assortment, which is unusual for online stores. The product prices for the items in the shop are low, but the shipping fee is high, at a flat $25 rate. I did not find third-party reviews for Drugs-depot.com from external platforms; on-site reviews are the only ones accessible for the store, but since they are unreliable, I don’t think that these reviews should be taken at face value. The shop was identified as a rogue store and was given a low trust rating. I don’t trust this store either, and I am awarding it with a score of 2 out of 5.